1Click Web Video Creator is a fast and powerful web video creator tool which can publish any video to webpage or blog with a web video player created. 1Click Web Video Creator Platinum convert various videos to Flash video first, e.g. convert MOD, TOD, MP4, 3GP, AVI, MPEG, MKV, ASF into FLV or SWF Flash video, and then publish the converted Flash video to webpage with a web video player created. Then you can play your favorite video on webpage. Convert any video to flash video then publish the video to webpage. ...... Then you can play your favorite video on webpage or blog via the web video player and share it with your friends over the Internet. 1Click Web Video Creator Platinum has powerful features to meet users' need. You can adjust the parameters of the output file, customize the background color, foreground color and the buttons color of the player. There are seven output modes supported. 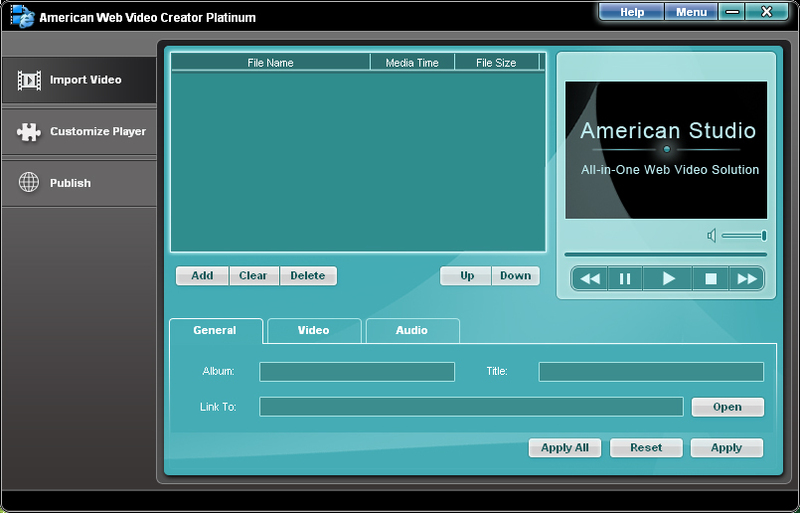 1Click Web Video Creator Platinum also allows people to customize the output mode by idio-need. Show video clips during video chat even without a real webcam. Easily put video on your site with the powerful VideoWebWizard 2.0 software. Free Video Creator - Video Editor. Video Editor, Cut and Rejoin AVI/DivX Files. Generating monthly web page calendars instead of coding them by hand. Qweas is providing links to 1Click Web Video Creator Platinum 1.2.8.608 as a courtesy, and makes no representations regarding 1Click Web Video Creator Platinum or any other applications or any information related thereto. Any questions, complaints or claims regarding this application 1Click Web Video Creator Platinum 1.2.8.608 must be directed to the appropriate software vendor. You may click the publisher link of 1Click Web Video Creator Platinum on the top of this page to get more details about the vendor.